As the 22nd United States Poet Laureate, Tracy K. Smith wants to make poetry more accessible to people across the country. But just how accessible can poems be? We put Tracy to the ultimate test by having her analyze this summer’s hottest hit, “Despacito” featuring Justin Bieber. Greta Johnsen: What does the a poet laureate do? 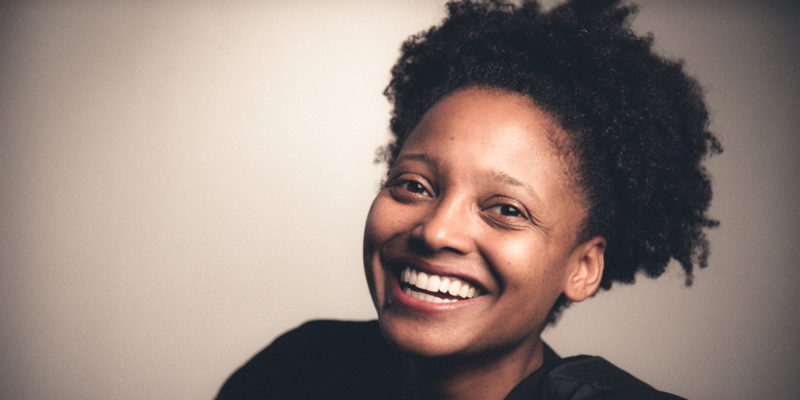 Tracy K. Smith: The job description is, you give a reading in the fall, you give a lecture in the spring, and in between that time, if there’s a project you’d like to do, great. And if not, think of ways you might make citizens more aware of poetry more informally. I’m thinking it might be nice to codify a plan. I have this real curiosity about the conversations I’m used to having in classrooms at Princeton or on panels at literary festivals — conversations about craft, but also about what poetry makes us recognize about ourselves and about the world. I’d like to have that conversation in other places with people who may not have interlocutors to talk about these questions and feelings. Johnsen: When did you go from being someone who wrote poetry to calling yourself a poet? Smith: I was an undergrad at Harvard. I knew I wanted to be a writer, but I hadn’t shown anyone anything. I hadn’t even written very much. I didn’t even know what my life was at that point or what I expected it to become. But I knew that thinking closely about experience in vivid language made me feel like I had a little bit more control. It made me feel like the world was something that I could slow down and begin to comprehend. I remember telling my roommate one Saturday night when she wanted to know why I wasn’t going out to this party, “I’m a poet. I’ve got to stay home and work on my poems,” and feeling suddenly like I believed that to be true. Johnsen: Do you think of poets as philosophers? Smith: I love that question. I absolutely believe that when we, as poets, can be quiet and let our egos sit out for a little while, I think we are good vessels for some kind of ambient philosophy or some kind of practical philosophy. That’s what I’m hoping for when I write a poem. That something that is useful to life and “being” might come out, almost as if by magic, through my own vocabulary and my own limited imagination. And my brother said, “Oh, yeah, that is a real thing, but people aren’t that anymore. There aren’t philosopher kings.” And I was really disappointed. Every now and then, still, when I’m feeling very grateful for my job, grateful that I get to do a lot of the things I just described, I think to myself, “OK, maybe the new title for that position is poet.” Although there’s not a great kingdom or great sense of dominion that comes with being a poet. But there is a sense of quiet and unmolested contemplativeness. Johnsen: When it comes to making poetry accessible, maybe it’s about expanding our definitions of poetry. Which of course led us to Justin Bieber. It seems to me that if we think of poetry of existing in all sorts of different places — like a pop song or an opera libretto, or in rural America or the Library of Congress, or the Hubble Space Telescope or David Bowie songs. It seems to me these are all, in some essence, poems. Do you disagree with that notion? Smith: I like what you’re saying, because I think it suggests that poetry is out there in the world, and we can be receptive to it. We can be the beneficiaries of whatever the poetic impulse creates. I believe that. I sometimes find myself just looking and seeing a particular bit of light on a sidewalk and thinking, “There’s feeling that lives in this thing I just saw.” That’s poetic. I’m not going to go home and try to turn it into a poem, but I’m grateful for this moment of quiet and lyric sensibility. I think you’re right. I think you can find it in varying degrees in every context. Now, Justin Bieber is the big step, but I’m excited to try. What else is poetry? It’s a really robust investment in experience. And it’s a certain willingness to be carried away. And I think, ultimately, it’s the wish to be changed by the things we encounter. And I think that can happen, in fact I think it has to happen, when we’re not expecting it. Johnsen: So can poetry live in pop music, like this summer’s hottest hit song, “Despacito” by Justin Bieber? Smith: This song, and the poetry that lives within it, is fun. What I like in the song is the way the speaker is willing, in this frantic quest to get this woman to be with him, to say, “OK, I’m going to give you the agency for a little while. I want to watch your hair dance. I want see all of the power that you have. I don’t even need to watch you dance, just your hair.” Then further down, that surrender of agency gets turned around, and he’s telling her all the things he wants to do to and with her. The song is doing what a lot of love poetry does — just coming up with an unignorable, and hopefully undeniable, plea for love. The relationship between poetry and song is something that we remind ourselves of every time we say, “Oh, this is a lyric poem,” or even, “Oh, that’s very lyrical.” We’re thinking about song. And as poems have moved from an oral tradition to something that is often now written, we forget to remind ourselves that these two forms were once married. This interview has been edited for brevity and clarity. Click the “play” button to listen to the entire conversation. Candace Mittel produced and edited audio of this podcast. Hunter Clauss adapted it for the web.